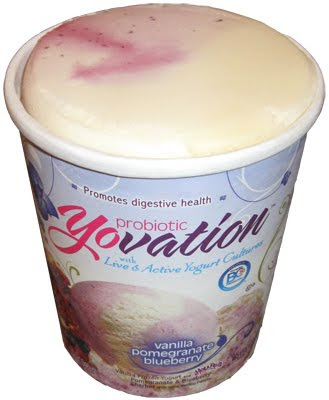 The last tasty Probiotic Yovation I got to try was the Vanilla Pomegranate Blueberry flavor, and it's got a special surprise for us. ...until I actually went to eat it. I love Hola Fruta, and I'm digging Yovation, but I just don't want them together. It's not that it's bad, I just don't want to mix my potent P-B Hola Fruta with the mild Vanilla Yogurt. I guess it seems contradictory since I like fruit flavored yogurt. Maybe I should have blended the two rather than scooping them... Maybe I'm getting too picky! Oh, just ignore me on this one and make up your own mind.